Are you looking for an easier way to Boston’s Seaport? The ferry is coming! OK, it’s a trial, but at least it’s a start. Additional information is available on the BBJ. Last year, four out of five deals were by companies in industries that previously were only minor players downtown: life science, pharma and healthcare. Millennials accounted for about 75% of Boston’s population growth, Jason says. 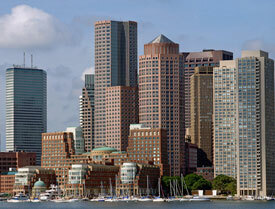 Look for office vacancy rates in Boston and Cambridge to drop by 200 bsp and rents to rise. Since 2010 in the popular East Cambridge and Seaport office markets, asking rates have jumped nearly 65%, he tells us. In the severely supply constrained luxury condo sector, the only major projects are Millennium Tower, One Dalton, 50 Liberty and Pier 4 (for which BRA’s Advisors Living is the marketing consultant). 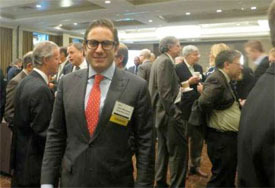 You can read the full article on Bisnow. 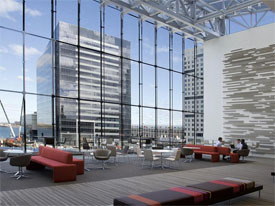 PwC is the newest tenant to migrate from the Financial District to the Seaport. Having their home on High Street of 376,650 square feet to settle into 333,500 might seem like a downsize, but in fact, they are simply more efficient. The use of hot, swappable workstations will be one of the key drivers to the firm requiring a smaller footprint. You can read the full article on the BBJ’s website.